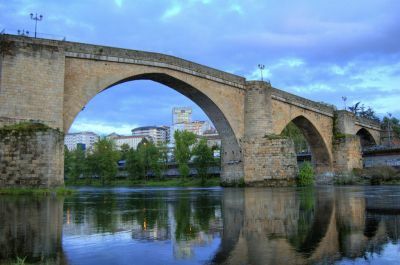 It is possible that the name Ourense has a Celtic origin, since the initial setting was the territory occupied by the thermal waters known As Burgas, even though the town, located on the left margin of the River Miño, has more connection to the Roman Auria. In relation to this, some archaeological samples of the period are preserved in its Provincial Museum. Part of this building contains an original Roman construction, next to the sewers of Cervantes Street, of the same era, and the so called Puente Viejo or old Roman Bridge, one of the most beautiful and oldest in Europe, which gives access to the city. The old centre of the city has been named as a whole National Artistic and Historical Monument and it incorporates the principal monuments of Orense, the Cathedral, besides the Plaza Mayor built in the second half of the XII Century, and as the old Episcopal Palace. An example of the Swabian period, and, of the active Medieval social life are the columns in the facade of the Church of Santa Mari­a Madre. These monuments have been undergoing transformations throughout their history. The Cathedral, a superimposition of Romanesque and Gothic, was not finished until the XVI Century and reconstructed, almost entirely, in the XIX Century. The current Church of Santa Mari­a Madre replaces another Romanesque one, lost for the most part in the XVIII Century.It can be reached by a small staircase from the romantic Magdalena square. The transition from the Romanesque to the Gothic can be appreciated in the cloister of San Francisco, a convent which was rebuilt at the beginning of the XVI Century, on the current site, as a witness to the ecclesiastic fights of the city. In the historic-civil buildings, stand out the house-palaces of the Boanes family, of the Oca-Valladares and the XVI and XVII arcades, which is the former jail of the Corona, and the ones that are next to the Hierro square, with its Renaissance fountain. Placed between the Plaza Mayor (Main Square) and the Posio gardens, with its horse chestnut trees, we can find the Church of the Santisima Trinidad, with an ogival portico and two cylindrical towers which flank the façade. Ourense is also a place for good restaurants and taverns, which the traveller can find in Cervantes and San Miguel streets, in order to taste the good Ribeiro wine and one of the gastronomic specialities of Galicia, before going shopping in Habana Avenue or El Paseo. Meet your Private English-Speaking Official local guide in the lobby of your hotel. If you are not staying in Ourense then you will meet your guide at the tourist office right at the Roman Bridge (Puente Romano). Starting with a walk across the Roman Bridge and viewing all the other Bridges over the River Mino. Then after you will walk around the old quarter and a visit inside the Pilgrimage Cathedral and the Provincial Archeology Museum. Tour will end in the Plaza Mayor, Main Square. We have reserved a table for your lunch either before or after the tour at a recommend restaurant. Entrance fees to sites when with guide. Designated meet point in the old quarter of Ourense (Details as to exact location will be in voucher). Meeting at hotels in city centre within walking distance to starting point. Ends in the old quarter of Ourense (Details as to exact location will be in voucher).